Following today’s release of Telstra’s startling survey revealing that: “almost one third of Australia’s motorists continue to use handheld mobile phones while driving despite acknowledging the practice is dangerous and against the law.” (see Telstra’s Media Release attached), the Chairman of the PCA, Mr Harold Scruby, today called on NSW Roads Minister Carl Scully to immediately announce that there would be double-demerit points for this and all other demerit point offences during the coming holiday period. “As for hand-held mobile-phones; a recent UK study revealed that the practice is more dangerous than low-range drink-driving - where the penalties include compulsory court appearance, 3 months loss of licence and at least double the monetary fine. Clearly the penalties for driving and/or texting while using hand-held phones are far too low, as this lethal behaviour remains at epidemic proportions.” Mr Scruby said. “Minister Scully and the RTA launched a program in 2000 promising the people of NSW that the Road Toll would be halved by 2010. Yet 3 years later, the road toll is still trending upwards, showing no signs whatsoever of reaching this objective nor any plans for reversing this horrific trend. The PCA calls on Mr Scully, in the first instance, to immediately introduce double demerit points for all demerit point offences over the entire period from Easter to the Anzac Day holiday weekend. ”We also call on Mr Scully to urgently review all demerit point and monetary penalties. Following an extensive study, the NRMA has echoed these calls stating in its March/April edition of Hub & Spoke (copy attached): ‘The Demerit Points Scheme needs to be reviewed to ensure it is fair, consistent and focussed on safety. All safety-related offences should incur demerit points. Penalties should be reviewed to ensure that offences that are more likely to endanger the community carry higher penalties’.” Mr Scruby said. “The PCA congratulates Telstra for its continuing strong support for road safety and demonstrating its corporate and community commitment in helping to save lives on our roads,” Mr Scruby concluded. Almost one third of Australia’s motorists continue to use handheld mobile phones while driving despite acknowledging the practice is dangerous and against the law, according to new research commissioned by Telstra. The research revealed that of those surveyed 63 per cent of NSW drivers received calls on their mobile handset while driving and 48 per cent made calls behind the wheel, despite the majority (89 per cent) knowing it was illegal. The NSW Police Service and NRMA Insurance are supporting Telstra’s Drive Safe. Phone Safe program, which aims to raise driver awareness before the Easter holidays. With new figures showing almost 7,500 drivers have been fined in the past seven months for using a handheld phone while driving, NSW Police today warned they would be targeting motorists who ignore the law. Telstra Consumer and Marketing Group Managing Director, Mr Ted Pretty, said Telstra’s latest research found that 28 per cent of NSW drivers surveyed acknowledged that using mobile phone handsets while driving was dangerous and caused many serious accidents. “Our research shows that drivers continue to ignore their better judgement, and the law, to take mobile phone calls while driving, despite knowing they are risking the safety of themselves and others,” Mr Pretty said. “Telstra is committed to encouraging responsible mobile phone use and through our Drive Safe.Phone Safe initiative we want to ensure that motorists make safety their most important call. NRMA Insurance Personal Injury and Health Insurance Group Executive, Mr Doug Pearce, said there was mounting evidence that driving while talking on a handheld mobile phone was contributing to road crashes. “Making a phone call while driving is like Adam Gilchrist trying to keep wicket with one hand tied behind his back,” Mr Pearce said. NSW Police Commander Traffic Services, Mr John Hartley, said people using handheld mobile phones while driving were jeopardizing their lives and the lives of innocent people. “Drivers are warned. NSW Police will aggressively pursue motorists who break the law and endanger other people,” Commander Hartley said. Mr Pretty said that while mobile phones provided enormous benefits motorists should not ignore the law and put people’s safety at risk. “To help support Police efforts, Telstra airs community service advertisements on television and at all National Rugby League matches. In addition, Drive Safe.Phone Safe brochures are available in Telstra Shops,” Mr Pretty said. The April 2003 National Drive Safe.Phone Safe Survey commissioned by Telstra investigated the mobile phone usage habits of motorists across New South Wales, Victoria, Queensland, South Australia and Western Australia, covering both metropolitan and country areas. The survey researched the responses of 750 mobile phone users. Results are based on data weighted by population of states. 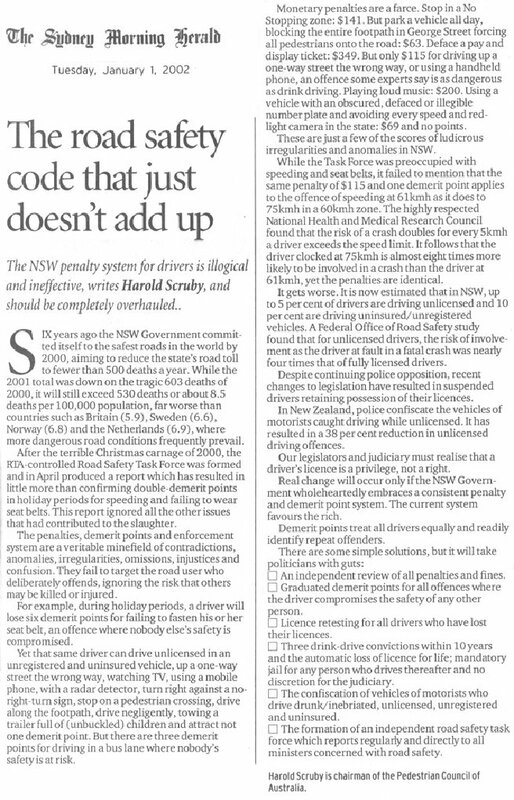 The NSW penalty system for drivers is illogical and ineffective, writes Harold Scruby, and should be completely overhauled ..
SIX years ago the NSW Government committed itself to the safest roads in the world by 2000, aiming to reduce the state's road toll to fewer than 500 deaths a year. While the 2001 total was down on the tragic 603 deaths of 2000, it will still exceed 530 deaths or about 8.5 deaths per 100,000 population, far worse than countries such as Britain (5.9), Sweden (6.6), Norway (6.8) and the Netherlands (6.9), where more dangerous road conditions frequently prevail. After the terrible Christmas carnage of 2000, the RTA-controlled Road Safety Task Force was formed and in April produced a report which has resulted in little more than confirming double-demerit points in holiday periods for speeding and failing to wear seat belts. This report ignored all the other issues that had contributed to the slaughter. The penalties, demerit points and enforcement system are a veritable minefield of contradictions, anomalies, irregularities, omissions, injustices and confusion. They fail to target the road user who deliberately offends, ignoring the risk that others may be killed or injured. For example, during holiday periods, a driver will lose six demerit points for failing to fasten his or her seat belt, an offence where nobody else's safety is compromised. Yet that same driver can drive unlicensed in an unregistered and uninsured vehicle, up a one-way street the wrong way, watching TV, using a mobile phone, with a radar detector, turn right against a no-right-turn sign, stop on a pedestrian crossing, drive along the footpath, drive negligently, towing a trailer full of (unbuckled) children and attract not one demerit point. But there are three demerit points for driving in a bus lane where nobody's safety is at risk. Monetary penalties are a farce. Stop in a No Stopping zone: $141. But park a vehicle all day, blocking the entire footpath in George Street forcing all pedestrians onto the road: $63. Deface a pay and display ticket: $349. But only $115 for driving up a one-way street the wrong way, or using a handheld phone, an offence some experts say is as dangerous as drink driving. Playing loud music: $200. Using a vehicle with an obscured, defaced or illegible number plate and avoiding every speed and red-light camera in the state: $69 and no points. 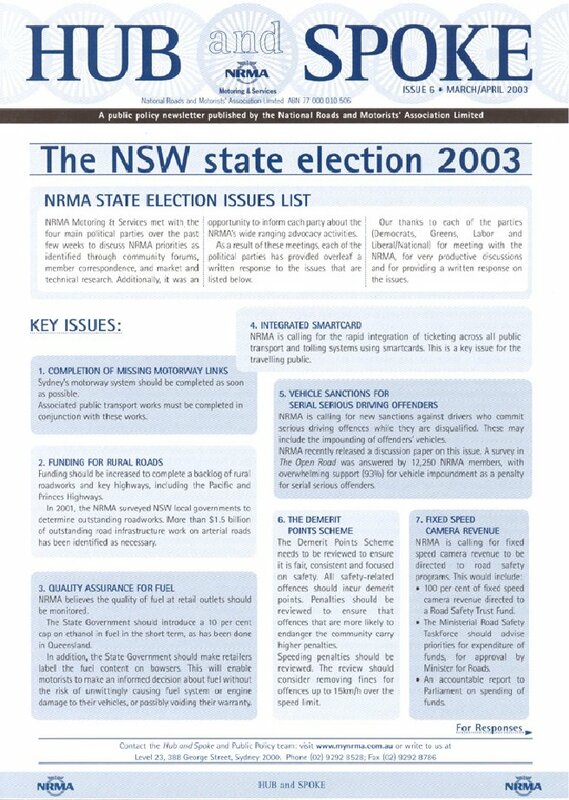 These are just a few of the scores of ludicrous irregularities and anomalies in NSW. While the Task Force was preoccupied with speeding and seat belts, it failed to mention that the same penalty of $115 and one demerit point applies to the offence of speeding at 61kmh as it does to 75kmh in a 60kmh zone. The highly respected National Health and Medical Research Council found that the risk of a crash doubles for every 5kmh a driver exceeds the speed limit. It follows that the driver clocked at 75kmh is almost eight times more likely to be involved in a crash than the driver at 61kmh, yet the penalties are identical. It gets worse. It is now estimated that in NSW, up to 5 per cent of drivers are driving unlicensed and 10 per cent are driving uninsured/unregistered vehicles. A Federal Office of Road Safety study found that for unlicensed drivers, the risk of involvement as the driver at fault in a fatal crash was nearly four times that of fully licensed drivers. Despite continuing police opposition, recent changes to legislation have resulted in suspended drivers retaining possession of their licences. In New Zealand, police confiscate the vehicles of motorists caught driving while unlicensed. It has resulted in a 38 per cent reduction in unlicensed driving offences. Our legislators and judiciary must realise that a driver's licence is a privilege, not a right. Real change will occur only if the NSW Government wholeheartedly embraces a consistent penalty and demerit point system. The current system favours the rich. Demerit points treat all drivers equally and readily identify repeat offenders. An independent review of all penalties and fines. Graduated demerit points for all offences where the driver compromises the safety of any other person. Licence retesting for all drivers who have lost their licences. Three drink-drive convictions within 10 years and the automatic loss of licence for life; mandatory jail for any person who drives thereafter and no discretion for the judiciary. The confiscation of vehicles of motorists who drive drunk/inebriated, unlicensed, unregistered and uninsured. The formation of an independent road safety task force which reports regularly and directly to all ministers concerned with road safety. Harold Scruby is chairman of the Pedestrian Council of Australia.